An abstract interpretation of the Lamborghini bull’s logo – vertical element viewed from afar which represent the entry point, astonishing, intriguing, curious and arousing wonder. The bull’s logo is detectable as a clear image only when sitting in a Lamborghini car (height 94 cm) looking towards the Museum. Apart from this point of view, the monument is displayed from all directions as a spatial drawing, incomprehensible, intangible. 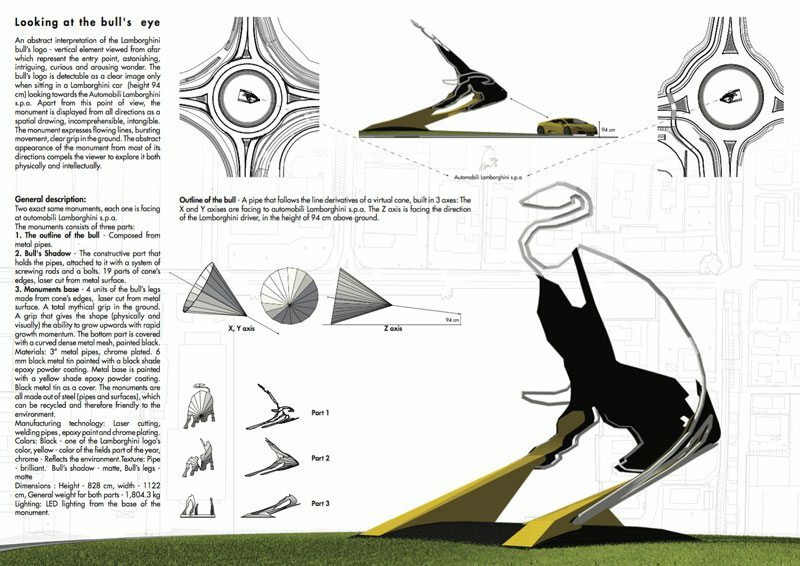 The monument expresses flowing lines, bursting movement, clear grip in the ground. The abstract appearance of the monument from most of its directions compels the viewer to explore it both physically and intellectually. Its curios forces movement around it aerial Lamborghini factory. The outline of the bull – Composed from metal pipes. Shadow’s bull – Constructive, 19 parts of cone’s edges, laser cut from metal surface. 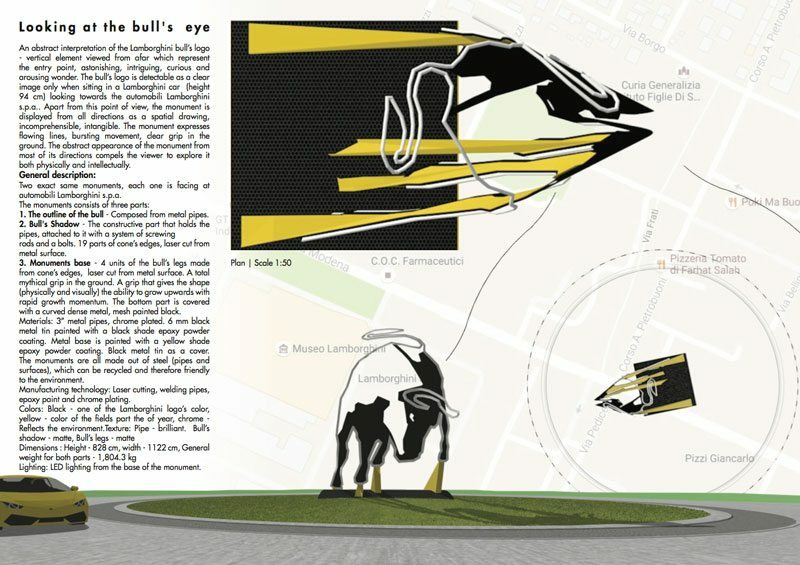 Monuments base – 4 units of the bull’s legs made from cone’s edges, laser cut from metal surface. A total mythical grip in the ground. A grip that gives the shape (physically and visually) the ability to grow upwards with rapid growth momentum. The bottom part is covered with a curved dense metal mesh painted in black. Materials: 4” metal pipes, chrome plated. 6 mm black metal tin painted with a black shade epoxy dusting. Metal base is painted with a yellow shade epoxy dusting. Black metal tin as a cover. Manufacturing technology: Laser cutting, welding pipes and cans, epoxy paint and chrome plating. Lighting: LED lighting from the base of the monument. Shadow’s bull:6 mm black metal tin, cut derivatives from a virtual cone’s edges. 19 straight laser cut and welded according to a plan. Total area – 24 sqm. Weight – 48 kg for sqm, Total weight – 1152 kg. Bull’s shadows is the structural link between the metal pipes and the bull’s legs. Bull’s legs: Placed with a 7 mm from the outline of the bull’s shadow. Thickness – 1.5 cm, metal surface with laser cut. Steel beams welded to the base. Base – 600/600 black tin 4 cm thick, installed on a concrete slab. Base cover – A 600/600 curved dense metal mesh painted in black, general height is 30 cm. Structural base – 600/600 concrete cast, 80 cm deep on a tight soil. 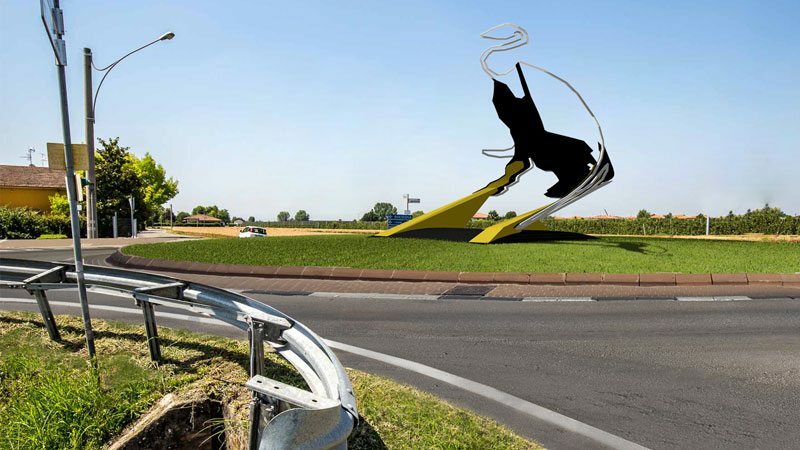 Outline of the bull – A pipe that follows the line derivatives of a virtual cone, built in 3 axes: The X and Y axises are facing the Lamborghini factory. The Z axis is facing the direction of the Lamborghini driver, in the height of 94 cm above ground.